Close your eyes for a second and think about this word: Motherhood. Do you see sweet tender moments of cuddling, tickling, and smiles? Or do you see yourself harried, stressed, and overwhelmed? Life can all too easily start to feel like an upward slog of tasks. If you’re increasingly feeling the pressure of the daily grind, keep reading. This will help. Pinky-swear promise. What in the world does a Gentle Giant have to do with motherhood? A Gentle Giant is something that slips through the back door of your mind, all sneaky-like, and then proceeds to gently stomp all over the assumptions, obligations, and status quo cluttering up your thoughts. My own Gentle Giant stepped in one Monday night at 8pm in the form of a book. This book, actually. It rearranged things in my mind, opening dusty old cabinets buried deep in my thoughts, and forcing me to ask questions I had long forgotten I had the freedom to ask. Is this something God is really calling me to do?Or am I just doing it because I hate disappointing people? Am I living my life on purpose? Or just floating down the river with my fingers crossed? I poured my coffee, sat down in my rocking chair, unintentionally got my mind rearranged, and it was glorious. The book is called Breaking Busy: How to Find Peace & Purpose in a World of Crazy. God used this book to help me reorient my priorities and really think about the paths I had been walking down. It was so helpful, in fact, that I had to share it with my favorite people on the planet: you. Here are five lessons that author, Alli Worthington, taught me about breaking busy and reclaiming peace. She doesn’t come from a high pedestal of “Let Me Tell You, Underlings, the Ways of Peace”. She’s writing from a place of “I’ve Come Through the Hell of Being Too Busy, and This is What I’ve Learned.” It’s refreshing. #1. Know Your Own Capacity. You’re not superhuman. You do not have a magical well of energy that never empties. For goodness sake, your body actually requires you go into a semi-paralyzed state every night, just so your brain can function the next day. We are not God. We have limitations. The first step in shattering the unsatisfying life of endless busyness is identifying where your limits are, and when you’ve passed them. Alli shares three things that limit capacity levels. You, my dear reader, are experiencing one of them. It’s called children. And you have them. Breaking Busy helps you understand your own natural and season-of-life limits, so you won’t overstep your own emotional and physical capabilities. #2. Embrace Your Gifts, Passions, and Calling. As you are wiping poo-smears and vomit-stains off of various surfaces, you may feel like questioning your calling or purpose. But feelings are such fickle things. You’ve been called to be a mom, absolutely, but it’s not your only calling. Within the call of motherhood, you can still find fulfillment in the passions and gifts that have been buried deep within you. Perhaps your passion is pottery. No, this may not be the time to start your own pottery studio. But it may be the perfect time to help your baby explore different textures through play dough, play snow, and other moldable adventures. Chapter Three in Breaking Busy helps identify your gifts, passions, and calling to explore how you can use those things in the midst of the life you’re currently living. How fun is that! #3. Break Out the Red Pen. Here’s a ridiculous news flash that made my sister roll her eyes and laugh: I realized, reading Chapter Four, that I COULD STOP DOING STUFF I ALWAYS DID. I know that’s not exactly profound, but I had gotten into the groove of life and just assumed everything on my list was there for a good reason. It’s like those baby socks that keep going through the wash, even though the “baby” is six years old. We just need to take the time to stop and throw out the socks. They’re just wasteful clutter complicating your life. It was freeing, really, to sit and listen to Alli talk about the difference between proactive and reactive life edits and how I can effectively use them to find the “socks” I need to keep and those I need to toss. Chapter Five of Breaking Busy is about analyzing your thoughts and beliefs about yourself and God. It’s easily the most highlighted chapter in my book. That hamster wheel of busyness, where we try to be “good enough,” is a never-ending cycle of stress and anxiety. I need to turn my thoughts towards God, and let the assurance of His love and care for me guide my decisions, time, and efforts. Cameron and I have a huge decision coming up this year. I’m pretty much talking to God about it constantly. I’ve been a Christian long enough to know God will reveal the right answer at the right time. Not worried, but definitely thoughtful. How does someone make a decision like this? The pros and cons are straight down the middle! There’s Scripture on both sides! Enter Breaking Busy. God is so good. Chapter Eight lays out some very practical tools to use when you’re making a decision, big or small. Right away I grabbed a piece of paper and started working through Alli’s “Five F’s of Decision Making” approach. Alli presents two different Decision-Making Frameworks for you to use in Chapter 8. Each one breaks down potentially overwhelming situations into manageable, bite-sized pieces. This allows you to keep moving through the issue and avoid getting stuck, causing a build-up of stress. Did we make a decision on that issue? No. We won’t have all the facts needed until March. But I know now how to organize those facts in a way that helps us pray and seek God in a much more specific way, rather than just some random Scripture searches and a “Please help me!” prayer. Breaking Busy isn’t just about managing your time better. It’s about those little decisions you make in the cracks of everyday life. All those values we think are taking center stage, but really end up being the understudy to the understudy. I think my favorite thing about Breaking Busy is how practical it is. With every chapter, Alli shares several Action Points to help you really start making adjustments. It’s a faith-based book that doesn’t let you sit back and ponder. It’s written for action, which is exactly the kind of advice you need! You don’t need to think over your crazy life! You need to do something about it! Breaking Busy isn’t about time management. It’s about LIFE management. Who’s willing to allow God’s Gentle Giant to walk around the living room of your mind and start clearing out the unnecessary and highlighting the truly important? Pick up your copy, start your Keurig, warm up your rocking chair, and let’s get started! I need a little bit of quiet time to myself each day to stay calm. I try to make sure that I don’t over commit myself on my days off so I can spend more time with my children. One thing I do to try to bring more calm into my life is listening to worship music and taking deep breaths. I do this when I get that awful anxious feeling in my stomach. I find that if I breathe in for a count of 4, hold for a count of 4, breathe out for a count of 4, hold for a count of 4, and repeat, it really helps to calm that anxious feeling in my stomach. Listening to worship music and/or reading Bible verses specific to God’s promises helps ease the anxiety too–especially keeping the anxious thoughts (“should haves” and “what ifs”) from running through my mind. I so need this book. The only thing I try to do for myself is to go to sleep at night if I find I can’t keep my eyes open anymore. Sometimes, I just need to sleep. You’re so welcome Natalie! I’m glad to hear it encouraged you! Working out helps calm me! This looks like a book most if not all of us need. I can’t wait to read it now! The best “new mom” advice I received was “focus on done, not perfect.” This has saved my sanity. I also give myself permission to just not do [enter chore here] and instead focus on quality time with my son and husband. The stove and shower will be clean.. someday…. Ohhhhhh, that’s good Katherine. Love that quote! This book sounds great! I’m always looking for helpful ideas… <3 your blog Heather! Freezer meals are a lifesaver right now with a newborn and toddler taking up all my time. Freezer meals and I are best friends. Good tip! I would really benefit from this book, I think! This book sounds incredible! 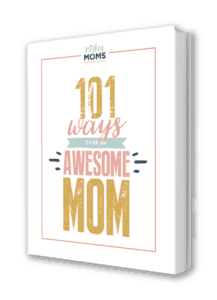 I love practical advice, and since becoming a mom 4 months ago, I am reading anything and everything I can to try to help figure out what I’m doing. I especially love the emphasis on God. We need more Christian values in this scary world of ours. I used to read. A LOT. Then after my daughter was born I went to sleep as soon as she did (she had a rough first year of sleeping, which is how we found your blog). Then I felt like I was too busy. I should spend time awake doing something productive. Now, I am trying to incorporate reading back into my life. I realize that having a cup of hot tea and curling up with a good book IS productive. It helps me unwind and clear my head so I can sleep better and feel like I’m doing something for me! Thank you so much for this article! For myself, on days when I am not going to work, I continue to set my alarm clock an hour before my 7 month old wakes to set up my day and have a calm cup of tea and a full breakfast. This has really helped to keep me relaxed despite the busy times in our lives. Those moments in the morning when the kids are sleeping are GOLDEN. Good for you, Kate, for making that a priority! I’m not sure what i do right now to slow down. I think that I make more lists! I’m going to have to check out this book. Sometimes just spending a few minutes at night to myself reading my Bible is how I calm down. Good suggestion, Brooke! A great way to organize your thoughts at the end of a long day!